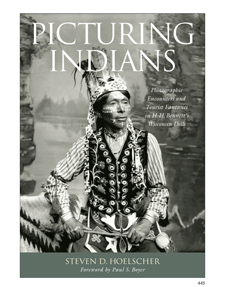 "Picturing Indians triangulates in brilliant fashion the cultural politics of Ho-Chunk life and labor, the imaginative and material shaping of the Wisconsin landscape, and the changing tourist landscape of photographs and curios at the turn of the twentieth century. . . . A fascinating and compelling book." Winner of the 2009 Book Award of Merit of the Wisconsin Historical Society. Today a tourist mecca, the area now known as the Wisconsin Dells was once wilderness—and a gathering place for the region's Native peoples, the Ho-Chunk, who for centuries migrated to this part of the Wisconsin River for both sustenance and spiritual renewal. By the late 1800s their numbers had dwindled through displacement or forcible removal, and it was this smaller band that caught the attention of photographer Henry Hamilton Bennett. Having built his reputation on his photographs of the Dells: steep gorges and fantastic rock formations, H. H. Bennett now turned his camera upon the Ho-Chunk themselves, and thus began the many-layered relationship unfolded by Steven D. Hoelscher in Picturing Indians: Photographic Encounters and Tourist Fantasies in H. H. Bennett's Wisconsin Dells. The interactions between Indian and white man, photographer and photographed, suggested a relationship in which commercial motives and friendly feelings mixed, though not necessarily in equal measure. The Ho-Chunk resourcefully sought new ways to survive in the increasingly tourist-driven economy of the Dells. Bennett, struggling to keep his photography business alive, capitalized on America's comfortably nostalgic image of Native peoples as a vanishing race, no longer threatening and now safe for white consumption. Hoelscher traces these developments through letters, diaries, financial records, guidebooks, and periodicals of the day. He places Bennett within the context of contemporary artists and photographers of American Indians and examines the receptions of this legacy by the Ho-Chunk today. In the final chapter, he juxtaposes Bennett's depictions of Native Americans with the work of present-day Ho-Chunk photographer Tom Jones, who documents the lives of his own people with a subtlety and depth foreshadowed, a century ago, in the flickers of irony, injury, humor, and pride conveyed by his Ho-Chunk ancestors as they posed before the lens of a white photographer. Steven D. Hoelscher is associate professor of American studies and geography at the University of Texas at Austin. He is the author of Heritage on Stage: The Invention of Ethnic Place in America's Little Switzerland, also published by the University of Wisconsin Press. "A model for photographic research."